Cable cleats designed and manufactured in Yorkshire by Ellis have been specified and installed by the U.S. Army Corps of Engineers (USACE) at the Fort Randall dam in Pickstown, South Dakota. The Fort Randall Dam Pipe Cable System Replacement project is being overseen by the USACE and involves the removal of 48,000ft of single conductor oil impregnated paper insulated copper cable, eight oil filled pipe cables and 8,000ft of steel pipe; and the subsequent installation of 48,000ft of single-conductor copper cable with 133% EPR insulation, including 96 total class 3- 15kv cable terminations. Tony Conroy, global sales director of Ellis, said: “The US Army Corps of Engineers had heard of our Centaur cable saddle, knew of our expertise in developing innovative project specific solutions, and contacted our US distributor, NASCO with a view to discussing the development of a bespoke solution for this particular project.” “The job itself proved extremely challenging, not least because of the tight constraints of the existing support structure. But by working together, the combined experience of the USACE engineers and our in-house design team meant we were able to arrive at and then deliver the perfect solution for the project.” The original idea for the Fort Randall project was to use a fixed cable tray/roller system, but the cable movement caused by thermodynamic forces meant that a snaked system was found to be more appropriate. Ellis’ bespoke solution required USACE modifications to the existing steel angle supporting structures to accommodate both its Centaur cable saddles and Centaur anchors. “The scale of the project needs to be seen to be believed,” added Tony. 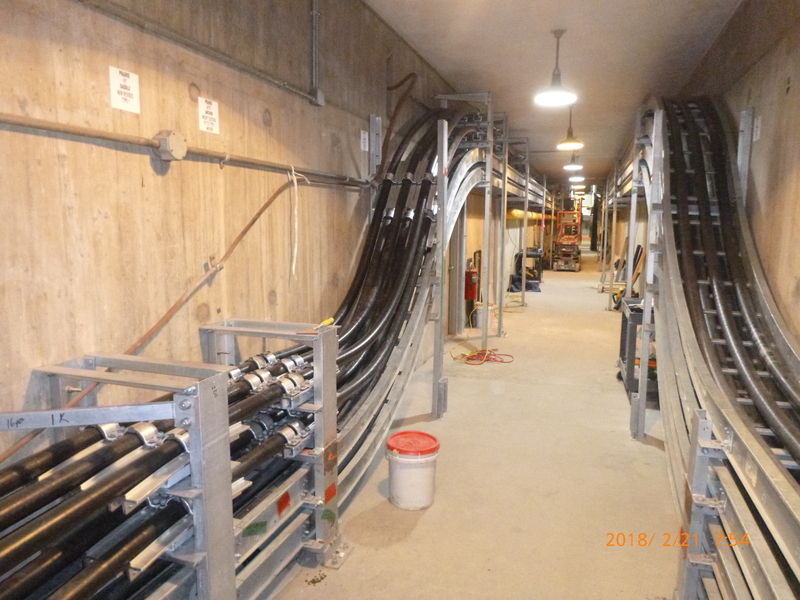 “For example, the eight oil filled pipe cables removed contained 24,000 gallons of insulating oil; and some of the circuits were an astonishing 1,500ft long.” The contractor for the Fort Randall Dam project was Colorado-based Interstate Electrical Contractors Inc., and the order was placed through Ellis distributor, California-based NASCO (North American Sales Company Inc.). The project is due for completion in September 2019. For additional information on Ellis and its Centaur cable saddles visit www.ellispatents.co.uk or call +44(0)1944 758395. Follow Ellis on Twitter at @ellispatents.